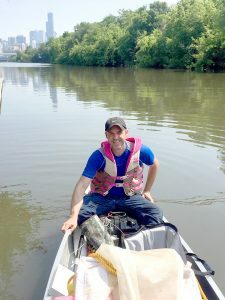 Every month, the Center for Great Lakes Literacy (CGLL), a close partner with IISG, selects an outstanding scientist who embodies the CGLL mission and inspires people to take action to improve the health of the Great Lakes watershed. This post originally appeared on the CGLL website. My interest in ecology is firmly rooted in where I’m from. I grew up in Edinboro, Pennsylvania, near Erie, and later lived in Pittsburgh and went to college in Buckhannon, West Virginia. My experiences in natural areas were places like Presque Isle, Point State Park, and Seneca Rocks. These are some of the most beautiful places in the world. The lakes, hills, rivers, and four seasons speak directly towards a sense of identity for those of us from the area. It is a landscape of extremes, because this region also has a heritage of heavy industry. Manufacturing and mining are important components of our cultural identity and provide the basis for commerce and quality of life. However, the history of mineral extraction, manufacturing, and contaminant storage left a legacy of insidious pollution throughout the region. My motivation for research in water pollution is rooted in that view so common in the Great Lakes and western Pennsylvania: the green and blue of Presque Isle in one direction and the smoke and metal of Erie’s industrial waterfront in the other. My overarching career goal is to work towards a restoration of ecological integrity within the urban and industrial areas where we work and live. I study the interaction between common pollutants and the organisms living in streams and rivers of the Great Lakes region. Water quality in the lakes strongly depends on what we put into the tributaries. 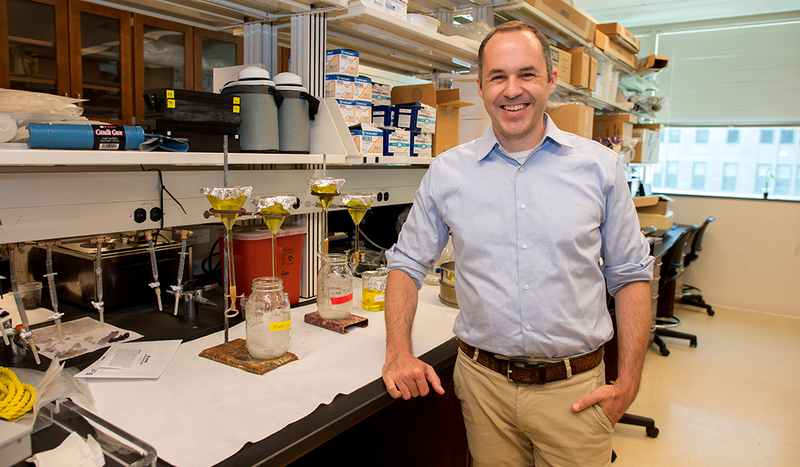 The pollutants I study include nutrients like nitrogen and phosphorus, which when in excess contribute to noxious algae blooms in the lakes, and small plastic particles, which affect microorganisms, insects, and fish that sustain aquatic food webs. In particular, I’m interested in how those materials move through streams and rivers, and whether they can be broken down, processed, or retained in streams before they go downstream. This requires first determining the sources of nutrients and microplastic, then measuring the interactions with those materials and microorganisms active in decomposition, and then determining how far downstream the chemicals are transported and how they are incorporated into food webs. I was fortunate to spend a week on Lake Michigan aboard the research vessel Lake Guardian, with a group of teachers from throughout the Great Lakes. We collected samples from the surface water and sediment throughout the lake, and I walked the teachers through the process of isolating plastic particles, including digestions, filtration, and counting particles on the microscope. One of my favorite things about the experience was the enthusiasm that the teachers brought to topic, and how each of them used their own unique talents to come up with creative ways to explain our work in their classrooms. One of the teachers brought a video camera to interview me, detail the collection and counting processes, and give his students and understanding of how and why we were doing this work. Another used video editing skills and a Go-Pro camera on the sampling equipment to put together fantastic videos of the devices we sent to the bottom of the lakes. This reinforced to me that teachers are at their best when they are using their talents, enthusiasm, and dedication to convey information in creative ways. I try to carry that spirit with me in my role as a teacher in the college classroom. In my role as a scientist and teacher, I’ve added to my focus on my studies and students, by looking for more creative ways to share the mission of my work, which includes community service, speaking with students of all ages, and engaging the general public and teachers whenever possible. I’ve found the time spent doing this spreads the message of the research to a broader audience, and deepens my appreciation for the career I’ve developed. Speaking with educators like those on the research cruise on the Lake Guardian was one of the best ways for me to communicate in this way, as the teachers can take that information to their schools and classrooms. Science requires a combination of lots of different skills. There are the obvious ones like attention to detail, curiosity about the natural world in all its forms, and the ability to think logically. One often overlooked ingredient for making a good scientist is an open mind with creative impulses. In order to make the step from one project to another, or the first step in a new project, a scientist has to come up with a new question to answer. This requires being interested in lots of different topics, being able to think about combining facts and ideas in new ways, and then creatively and carefully explaining those ideas to collaborators, funding sources, and students. Contact Tim Hoellein at thoellein@luc.edu.